Our property has only sandy soil at most places, even in the depth of 3 meters deep under the surface only sand, without significant layer of topsoil and humus layer. The trials to cultivate bananas despite of this were not very successful. 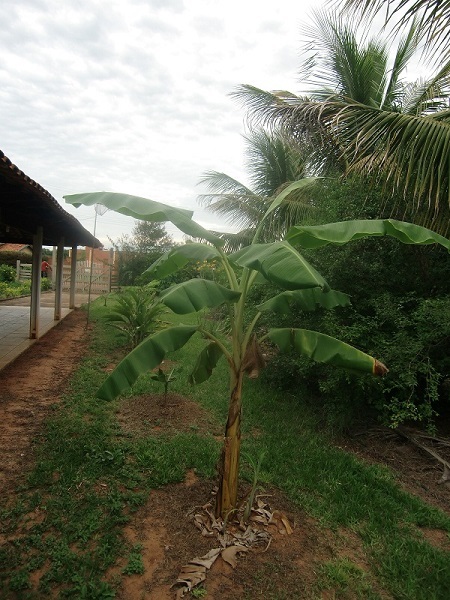 Banana cultivation is not possible anywhere on our property, only near the house and in partial shade with red loam, which is used as a stabilizer for the foundations of the houses in Lucianópolis. The red clay soil is more fertile than the sand, holds more water tight than the sand. The former banana plantation of our housekeeper Antonio has red clay soil, also the property of Helton Josué in Angatuba. Only where the sand was prepared in the catchment area of ​​our water tower with red clay soil, leaves and organic matter from the branch cut and the plants are mulched with leaves and branch cut, the bananas still thrive well, even with a lot of fertilizer. The mulch layer of branch cut and foliage keeps the planting area moist and cool, and protects the roots from overheating and drying out too quickly. In order to enrich the sandy soil with nitrogen, is peanut (Arachis hypogaea) grown, the peanut grows well in sandy soil. Under the big avocado tree I left much foliage as a thin humus layer has been formed under the foliage. Also with horse manure I had good experiences, the bananas grew well with horse manure, horse manure and humus formed structures. But the neighbor opposite our street unfortunately does not have any more horses, so we got no more horse manure. At the pond the conditions for a limited banana cultivation are good, however without much support bananas grow well at the pond, the ground-water level is high, it is a rather swampy terrain. Even in the dry season it stays there usually green. The bananas are grown even biggest and even have blossomed and fruited! The light shade encourages the growth of bananas, bananas grow wild at locations near the forest, in clearings and on the river and lake shores, where the soil is rich in organic matter. One special garden for bananas is created at the pond. In the area Loteamento das Antas in Lucianópolis the soil consists largely of sand without appreciable humus layer. 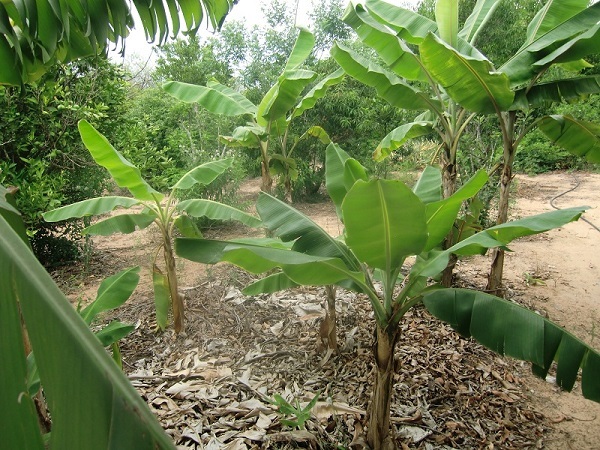 Banana production is difficult there, many bananas do not grow as well and often do not bear fruit. So our Japanese neighbor, who runs a vegetable market garden, has been trying for more than 8 years to grow bananas too and they grew poorly and never flowered and fruited, while I was much more successful due to more accurate observations, experiments, expertise, experience with bananas and cooperation with an experienced former banana farmer. 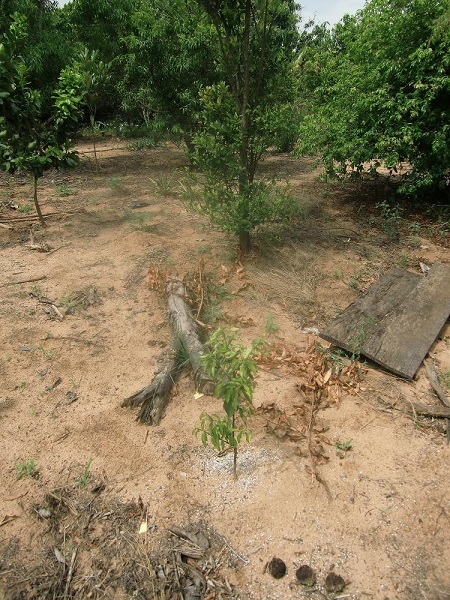 It is forbidden by the community Lucianópolis to cover the whole plot with red clay soil, because of the many springs and streams, the soil may not be made less permeable through clay, otherwise the water balance is disturbed. As the red clay soil can be used limited, the best solution is to produce a humus layer of Terra Preta. Terra Preta is very fertile and rich in organic matter. Over 100 years ago in the region of Lucianópolis was dense tropical rainforest has been cut down and burned by settlers, the floor was directly exposed to the tropical rains, eroded over time and lost after a few years of agricultural use increasing fertility and lost nutrients. The humus layer was washed out, so today was left only the bare sand. Also in the Amazon region the rainforest is cut down and burned and converted into pasture, which erodes more and more to the steppe and desert. The humus layer can only be formed and retained when the soil is always in the shade of the trees and stays cooler, the trees protect the soil from drying out and from being washed out by tropical downpours, the roots also held the soil firmly. And the fall foliage and discarded branches are remaining and decompose gradually to organic matter or humus layer. Unfortunately, tree and garden cut is simply thrown into the street and disposed of by the garbage disposal. 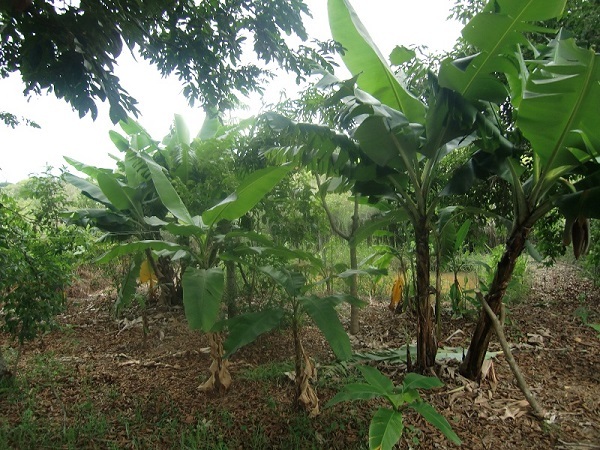 It must achieve ecological cycle to make a garden or a chácara fertile and make suitable for growing bananas. The tree and garden cut is crushed and placed as a mulch layer under the existing trees. There are also planted trees that grow well on sandy soils and are good shade trees. No eucalyptus trees shall be planted that they grow quickly and to deprive the soil of many nutrients and water, and are also too large and interfere with the power lines and the reception of satellite dish. The best should be planted in Brazil native fruit trees, which are also available at Colecionando Frutas. Also, avocado (Persea americana) is suitable. In the mulch layer also cattle or horse manure should be mixed, and occasionally some lime. And the thicker stems and branches of the tree cutting can be made into charcoal, which are then crushed and placed in the mulch layers. And again in layers. Thus forming over time a fertile humus layer, also known as Terra Preta. More information about Terra Preta at the link at Wikipedia. To realize the project, a permanent residence in Brazil is required, even visa-free 90 days stays in semi-annual periods for us EU citizens and Germans are not suitable for this project because this project requires constant presence in our chácara to make the crosses, to observe the germinations, young plants and to control and supervise, as professionals and experienced experts in this field such as Dr. Chris Stührk (PhD degree in biology, currently lives in Cologne in Germany) are required. To get the proper residence permits, we are looking for a nationally recognized institution in Brazil and sponsors who support our two projects "Cold Hardy Fruit Banana” and "Terra Preta". Especially Dr. Chris Stührk is looking for an institute in Brazil in the state of São Paulo, for which he could act. I myself have self-taught my knowledge of bananas over the years, read-up on it, experimented and shared experiences and knowledge with scientists, even with the famous banana researcher Markku Häkkinen , in internet forums and banana lovers , and wrote a book about bananas in German language with the title "Tropische, subtropische und winterharte Bananen". I run banana research as a hobby, have no high school diploma and have never studied, but a very good secondary school certificate which qualifies me for high school, I was top of the class, also have a commendation certificate of the Nuremberg Chamber of Commerce as the best of the final examination year group 1991 of the vocational training center of Nuremberg, I completed my retraining as office clerk with distinction. This shows a high level of IQ that only 3 of 1000 people do have. Since 2007 I am learning Portuguese in private lessons. I could also send you a reference copy of my book in German (if you do have no knowledge of German, you can also use the Portuguese version of our website about bananas and our banana special garden at the pond as a reference), if you allow me to apply a Brazilian scientist visa (link from the Brazilian embassy in Berlin, only German) that even the Polícia Federal in Bauru has recommended for me on January 7th, 2013 as my application for tourist visa extension to early March 2013 was denied because of a new tourist residence law for EU citizens except citizens of the United Kingdom, Ireland, Portugal and Poland and only a small extension until February 1st, 2013 was authorized. In the case of success of the project bananas could be grown in more places on our property, so our banana collection could be expanded and there also may arise in our chácara more and new opportunities for growing bananas. The findings and results could benefit to our neighbors in the Loteamento das Antas, but also in other regions of Brazil, where the tropical rain forest has been cut down and the soil should to be reclaimed to make it agriculturally capable again. Which nationally recognized Brazilian institute and which sponsor with contacts to nationally recognized institutes want to support us? Contact please by email to Mr. Dr. Chris Stührk (German, English, little Portuguese knowledges), Helton Josué Teodoro Muniz (Portuguese) or to me (German, Portuguese and English), Joachim Jäck. Here you see clearly the sandy soil without real humus layer. the foundation of our house. stand in the half shade. fall foliage of surrounding trees self, the best place for bananas on our yard.